weber_cam: I might give these guys names. I might give these guys names. 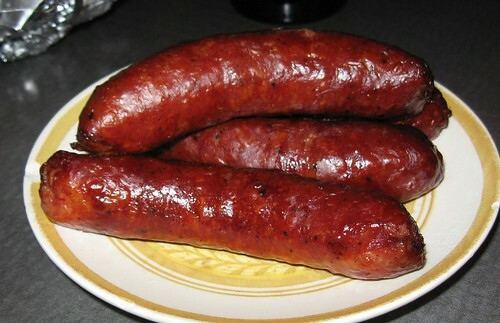 In the grocer's meat case, there is no shortage of products called "smoked" sausage. Most of these products are bland. This past weekend, we were in Newark, Ohio and ate at a place called Dicky's. Chain bbq place, but good. Had some lovely smoked kielbasa (or brats?) and immediately, I had a mission. My new favorite hangout online these days is The Virtual Weber Bullet Forums. Perhaps the most informative and civil forum I've ever visited. Lots of good information and courteous contributors. From a discussion today, I gleaned I should smoke sausage low 'n slow, with apple wood if possible and to an internal temp of 170F. I got some kielbasa from Giant-Eagle today, smoked between 250-275F (dome temperature) for about 2 hours using lump with a mixture of mesquite and lump. I took 'em off at an internal of 180F because I was distracted socializing around the neighborhood. However, they smelled so good, we almost had them as a second dinner. I wrapped them and put them in the fridge. I may make use them in red beans and rice. Not sure. For now, I'll just stand in the fridge and smell the smokiness of a real smoked sausage. Is the grocery store kielbasa already smoked? Ekrich is and it's barely smoky if at all. Most others, Johnsonville, etc. are not smoked.